Toronto, Ontario, May 16, 2018 – Compass Gold Corp. (TSX-V:CVB) (Compass or the Company) is pleased to announce that its Warrant Holders have exercised approximately 2.3 million warrants from the November 2017 private placement (see News Release dated November 29, 2017), for gross proceeds to the Company of $830,000. These funds will be used to supplement the Company’s existing treasury for the ongoing exploration of its Sikasso gold properties located in the prolific greenstone belts of southern Mali. All of the 2,000,000 warrants that expired on May 4, 2018 were exercised at a price of $0.35, along with the 84,000 broker warrants, for total proceeds of $750,000. A further 228,571 warrants expiring on May 15, 2018 were exercised at $0.35 for total proceeds of $80,000. The exercise of these warrants brought Compass’s total number of shares outstanding to 29,738,522. Toronto, Ontario, May 7, 2018 – Compass Gold Corp. (TSX-V:CVB) (Compass or the Company) is pleased to provide an update on the previously announced (see Compass news release dated April 3, 2018) ongoing deep soil auger geochemical survey program at the Ouassada exploration permit on its Sikasso Property in Southern Mali. ● Deep soil auger sampling has identified a broad 1.5 km wide long and 12 km long zone of anomalous gold at an average depth of 13 m beneath and coincident with the previously reported shallow soil sampling areas. This anomaly, which closely correlates with the bedrock geology, remains open to the north. ● Gold concentrations up to 2,600 parts per billion (ppb) gold (Au) (2.6 grams per tonne (g/t) Au) occur at the artisanal workings at Farabakoura, and up to 722 ppb Au located 500 m southeast of the workings at Kabangoué North. Highest gold concentrations are not restricted to areas of known workings. ● Close correlation of anomalous zones with shallow soil geochemistry and a mapped fault bounded Birimian volcanoclastic unit. ● A total of 1,786 3-m composite deep soil auger samples from 11,556 m of drilling were analyzed over target area 1. Toronto, Ontario, April 3, 2018 – Compass Gold Corp. (TSX-V:CVB) (Compass or the Company) is pleased to provide an update on the previously announced (see Compass news release dated Feb. 28, 2018) ongoing shallow soil geochemical survey program at the Ouassada exploration permit on its Sikasso Property in Southern Mali. Four additional parallel, northwest-trending gold anomalies have now been identified over strike lengths up to 12 km and widths up to 2 km (see Figure below), bringing the total to nine. Highest soil samples contain 3,800 parts per billion (ppb) gold (Au) (3.8 grams per tonne (g/t) Au) 550 m north of artisanal workings at Farabakoura. Highest gold concentrations are not restricted to areas of known workings. In this latest round of work, a total of 1,139 shallow soil samples were collected on the Ouassada permit where the average gold background for shallow soil samples was 5 ppb. 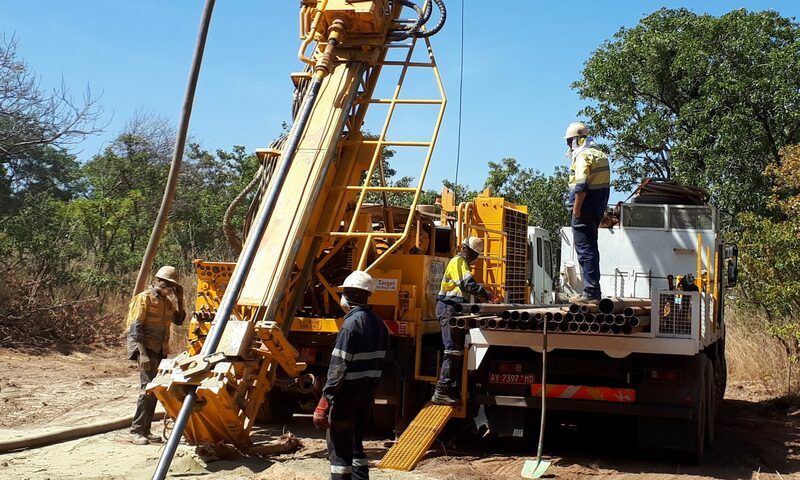 Deep soil auger sampling at Ouassada is now 90% complete, and the shallow soil sampling is currently taking place on the Sankarani permit with 88% of the samples collected. High-resolution Airborne geophysical interpretation, and structural and hyperspectral remote sensing (satellite) studies have been initiated. Click here for full news release. Toronto, Ontario, February 28, 2018 – Compass Gold Corp. (TSX-V:CVB) (Compass or the Company) is pleased to provide an update on the shallow soil geochemical survey program on the primary target within the Ouassada exploration permit on its Sikasso Property in Southern Mali (see Figure 1). ● Two parallel, northwest-trending gold anomalies identified over strike lengths up to 12 km and widths up to 1 km (see Figure 2). ● Highest soil samples contain 3,800 parts per billion (ppb) gold (Au) (3.8 grams per tonne (g/t) Au) 550 m north of artisanal workings at Farabrakoura, and 1,200 ppb Au from a surface nodular iron oxide 350 m west of the workings at Farabrakoura. Highest gold concentrations are associated with areas near current artisanal gold workings, although anomalous samples are not restricted to known workings. ● A total of 2,342 shallow geochemical samples were collected over the main target area on the Ouassada permit where the average gold background for shallow soil samples was 5 ppb and 8 ppb for nodular iron oxide samples. ● Deep soil auger sampling continues on the primary target area while the near surface geochemistry teams move to the next target areas on the Ouassada and Sankarani permits. Toronto, Ontario, January 15, 2018 – Compass Gold Corp. (TSX-V:CVB) (Compass or the Company) is pleased to provide a one-month update on its previously announced gold exploration program on its Sikasso Properties in Southern Mali (see Compass news release dated Dec. 18, 2017). Dr. Madani Diallo, Compass’s Exploration Manager, and his team of four local geologists, initiated a new exploration program in early December 2017. They are examining the first priority anomaly target identified on the Ouassada property, part of the Yanfolila permit block in the northwestern portion of Compass’s property area (see map below). This is the first of 35 near-surface gold targets the Company plans to examine on its properties during 2018. Toronto, Ontario, January 12, 2018 – Compass Gold Corp. (TSX-V:CVB) (Compass or the Company) announces that a total of 2,145,000 options to purchase common shares of the Company were granted to various directors and officers of the Company on December 31, 2017 at a price of $0.50 per share for a period of five years. These options were part of the options set aside as noted in the Company’s Notice and Information Circular for its Annual and Special General Meeting held on November 16, 2017. The grant is subject to regulatory approval. Toronto, Ontario, December 18, 2017 – Compass Gold Corp. (TSX-V:CVB) (Compass or the Company) is pleased to announce the formal appointment of three new members to the executive management team. As previously announced by the Company on November 29, 2017, Larry Phillips has been appointed President and Chief Executive Officer. At a meeting of the Board of Directors on December 12th, the Directors appointed Louis Nagy as the Company’s Chief Financial Officer and Corporate Secretary, replacing Lara Iacusso and Danica Topolewski. The Directors also appointed Sandy Archibald, PhD, PGeo, as Technical Director and Greg Taylor as Director, Investor Relations and Corporate Communications. Further information about the management team is set out below. Vancouver, BC and Sydney, Australia, November 29, 2017 – Compass Gold Corp. (NEX:CVB.H) (Compass or the Company) is pleased to announce the completion of the previously announced acquisition (see Compass news release dated Aug. 23, 2017) of all of the issued and outstanding shares of Mali Gold Exploration Pty Ltd (MGE) (Acquisition), concurrent with a one-for- five share consolidation (Consolidation) and non-brokered private placement of $6,000,000 (Private Placement) (together the Transaction). The Company’s common shares will commence trading on the TSX Venture Exchange (the TSXV or the Exchange) as a Tier 2 issuer under the symbol “CVB”, on a post consolidation basis on November 30, 2017. The Company announces a variation to the terms of the previously announced Private Placement such that the Company will now issue units in the Company rather than common shares. Each Unit will comprise of one common share of the Company and one transferable common share purchase warrant. Vancouver, BC and Sydney, Australia, August 23, 2017 – Further to the new release dated July 13, 2017 Compass Gold Corp. (NEX:CVB.H) (Compass or the Company) and Mali Gold Exploration Pty Ltd (MGE) are pleased to announce that they have entered into a binding share exchange agreement (the Agreement) dated August 23, 2017 (as signed by the two companies and MGE’s shareholders), whereby Compass will acquire all of the issued and outstanding shares of MGE (the MGE Shares) in exchange for the issuance of Post‐Consolidation Shares (as defined below) of Compass to the shareholders of MGE. The acquisition of MGE (the Acquisition) will constitute a Reactivation and a Reverse Takeover of Compass as such terms are defined in the policies of the TSX Venture Exchange (TSXV or the Exchange).